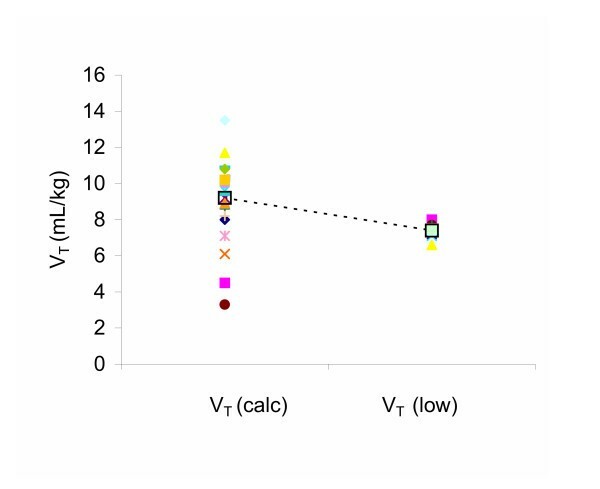 With biologically variable ventilation [BVV – using a computer-controller to add breath-to-breath variability to respiratory frequency (f) and tidal volume (VT)] gas exchange and respiratory mechanics were compared using the ARDSNet low VT algorithm (Control) versus an approach using mathematical modelling to individually optimise VT at the point of maximal compliance change on the convex portion of the inspiratory pressure-volume (P-V) curve (Experimental). Pigs (n = 22) received pentothal/midazolam anaesthesia, oleic acid lung injury, then inspiratory P-V curve fitting to the four-parameter logistic Venegas equation F(P) = a + b[1 + e -(P-c)/d ]-1 where: a = volume at lower asymptote, b = the vital capacity or the total change in volume between the lower and upper asymptotes, c = pressure at the inflection point and d = index related to linear compliance. Both groups received BVV with gas exchange and respiratory mechanics measured hourly for 5 hrs. Postmortem bronchoalveolar fluid was analysed for interleukin-8 (IL-8). All P-V curves fit the Venegas equation (R2 > 0.995). Control VT averaged 7.4 ± 0.4 mL/kg as compared to Experimental 9.5 ± 1.6 mL/kg (range 6.6 – 10.8 mL/kg; p < 0.05). Variable VTs were within the convex portion of the P-V curve. In such circumstances, Jensen's inequality states "if F(P) is a convex function defined on an interval (r, s), and if P is a random variable taking values in (r, s), then the average or expected value (E) of F(P); E(F(P)) > F(E(P))." In both groups the inequality applied, since F(P) defines volume in the Venegas equation and (P) pressure and the range of VTs varied within the convex interval for individual P-V curves. Over 5 hrs, there were no significant differences between groups in minute ventilation, airway pressure, blood gases, haemodynamics, respiratory compliance or IL-8 concentrations. No difference between groups is a consequence of BVV occurring on the convex interval for individualised Venegas P-V curves in all experiments irrespective of group. Jensen's inequality provides theoretical proof of why a variable ventilatory approach is advantageous under these circumstances. When using BVV, with VT centred by Venegas P-V curve analysis at the point of maximal compliance change, some leeway in low VT settings beyond ARDSNet protocols may be possible in acute lung injury. This study also shows that in this model, the standard ARDSNet algorithm assures ventilation occurs on the convex portion of the P-V curve. Mathematical modelling has contributed to our understanding of lung mechanics and helped direct therapy in patients with acute respiratory distress syndrome (ARDS). Hickling [1, 2] generated sigmoidal pressure-volume (P-V) curves based on a model where airway opening could occur over the entire inflation limb. Venegas and colleagues [3, 4] devised a four-parameter logistic model to fit P-V inflation curves in patients with ARDS. In most instances, the Venegas equation fits static P-V data with great precision. Such modelling indicates that ventilation is limited to the convex portion of the static inflation curve when the low tidal volume (VT) ARDSNet algorithm is utilised . We have recently shown mathematically that if ventilation is occurring on the convex portion of the P-V curve, there is an advantage to adding noise to the end-inspiratory pressure signal [6, 7]. Using a newer mode of mechanical ventilation – termed biologically variable ventilation (BVV) – noise is added to the end-inspiratory pressure signal . As configured this noise can be shown to have fractal or 1/f characteristics . This computer-controlled ventilator simulates breath-to-breath variation in respiratory frequency (f) and VT that characterises normal spontaneous ventilation. The added noise results in greater mean VT over time at the same mean driving pressure. This, perhaps counter-intuitive finding, can be deduced by applying Jensen's inequality – a simple probabilistic proof [7, 10]. Jensen's inequality states that the average or expected value of a convex function over a random variable is greater than the value of that function at the average of the random variable. In mathematical terms in the notation of the Venegas equation, "if F(P) = V is a convex function defined on an interval (r, s), and if pressure (P) is a random variable taking values in (r, s), then the expected value (E) at F(P); E(F(P)) > F at the expected value of P; F(E(P))." Such conditions are met with BVV since noisy ventilation provides a series of individualised observations of pressure (P), that are transformed to volume F(P) as determined by Venegas curve fitting. Jensen's inequality, thus, provides us with an important tool to determine if noise will be beneficial or not. Indirectly it also indicates where the noise will be most beneficial – when ventilation is centred at the point where the convexity is most pronounced – the point where the second derivative of the convex interval of the function is maximised. For the Venegas equation this occurs at the point of maximal compliance change: when P = c - 1.317d or when V = a + 0.211b [3, 6]. Based on the above information, we designed an experiment to compare the presumed "mathematically optimised" point about which to centre noise (Experimental) to an approach using the ARDSNet algorithm (Control). We presumed that the ARDSNet algorithm would also result in ventilation on the convex portion of the P-V curve, but advanced the hypothesis that by mathematical modelling individual P-V curves, we could find an optimised strategy for BVV that would result in discernable improvements over an approach using the ARDSNet algorithm alone with BVV. A porcine model of lung injury with oleic acid was studied. We compared gas exchange, respiratory mechanics and a single marker of inflammation over 5 hrs for the two approaches. Twenty-eight pigs were studied following the Canadian Council on Animal Care Guidelines. The experimental preparation has been described previously . Briefly, animals were ventilated initially with an Esprit® ventilator (Respironics Inc., Carlsbad, CA) using VT = 12 mL/kg, f = 20 bpm, FIO2 0.5 and PEEP 4 cm H2O during surgical placement of monitoring cannulae. Anaesthesia was maintained with an intravenous loading dose and continuous infusion of sodium thiopental/midazolam at 16/0.1 mg/kg/hr and paralysis with doxacurium infusion (1.5 – 2 mg/kg/hr). Baseline measurements were obtained and an infusion of oleic acid (BDH, Toronto, ON) started at 0.2 mL/kg/hr through a catheter, placed in the inferior vena cava, above the level of the diaphragm. The oleic acid infusion was continued until PaO2 decreased to <80 mm Hg for two consecutive measurements, 5 min apart (20 – 45 min of infusion), and the volume noted. An additional 4 cm H2O PEEP was then added (to a total of 8 cm H2O) and arterial blood gases were obtained at 10 and 15 min. The criterion for study inclusion was a PaO2 > 80 mmHg and <200 mmHg on 8 cm H2O of PEEP. This was not considered to represent steady-state but was used as an index of adequate lung injury (PaO2 < 80 mm Hg) as well as evidence for lung recruitability (80 < PaO2 < 200 mm Hg). A continuous infusion of dopamine (5 – 10 μg/kg/min) was started with oleic acid infusion to maintain mean arterial pressure > 50 mmHg. where: a = volume at the lower asymptote, b = the vital capacity or the total change in volume between the lower and upper asymptotes, c = pressure at the true inflection point and d = an index of the linear compliance for the curve. The maximal rate of change in compliance is the point where the second derivative is maximal: found at the point P = c - 1.317d or V = a + 0.211b. The animals were then randomised to BVV centred at VT of 7 mL/kg, (Control) or at the VT corresponding to the maximal rate of change in compliance from the P-V curve (Experimental) for 5 hrs. We used the computer-controller and software to generate the variable ventilatory pattern as previously described . A representative variability file is shown in Figure 1. FIO2 was set at 0.5 with PEEP 8 cm H2O. Respiratory frequency was initially set at 25 bpm. We followed the ARDSNet algorithm for pH control – the base VT of 7 mL/kg in the Control group is greater than the 6 mL/kg seen in human studies due, in part, to dead space associated with in-line breathing circuit measurement devices. If pH fell below 7.2, f was incrementally increased by 5 bpm up to a maximum of 35 bpm. If respiratory acidosis persisted, VT could be adjusted in increments of 0.5 mL/kg to a maximum of 8 mL/kg. Haemodynamics, airway pressures, arterial and venous blood gases and static compliance were determined at baseline, after oleic acid, after generation of the P-V curve and then hourly for 5 hrs. Delivery of Variable Tidal Volume. The complete data set of delivered tidal volume (VT) using BVV in one animal. There were 376 breaths in the file. Mean VT was set at 180 mL in this example. Bronchoalveolar fluid aspirates were obtained immediately post-mortem. These samples were frozen and kept at -80°C until analysis. Analyses were made in duplicate to determine the concentrations of IL-8 by sandwich ELISA. A species-specific assay was used (IL-8, Medicorp KSC0082, detection limit 10 pg/mL). ELISA plates were incubated at 4°C overnight with 50 μL per well with 1 mg/mL of anti-IL-8. Plates were washed 4 times and nonspecific binding was blocked with 200 μL of phosphate-buffered saline (PBS) with 2% bovine serum albumin (BSA) per well for 90 min. Diluted cell-free supernatants (50 μL) were added and incubated for 3 hr. A volume of 50 μL (1 mg/mL) of biotinylated antibody was added and incubated for 60 min. Subsequently, avidin peroxidase conjugate was added (Bio-Rad Laboratories) followed by chromogen substrate (ortho-phenylenediamine [OPD], Dako). Plates were read at 490 nm using an ELISA reader (Rainbow Reader, SLT Lab Instruments). The analysis of aspirates was done in a blinded fashion at the James Hogg iCAPTURE Centre for Cardiovascular and Pulmonary Research, University of British Columbia. Data were analysed by repeated measures analysis of variance (ANOVA) as previously described. The group × time interactions were considered significant when p < 0.05. Least squares means test matrices were generated for post-hoc comparisons and Bonferroni's correction applied for multiple comparisons within groups. Single between group comparisons were by unpaired t-test; p < 0.05 considered significant. Four pigs died after generation of the P-V curve or within one hr of initiation of mechanical ventilation due to profound hypoxaemia and were excluded from analysis. Two pigs were excluded prior to randomisation for failure to meet blood gas criteria leaving 22 animals that completed the protocol, 11 in each group. There were no differences in body weight, volume of oleic acid infused, or dopamine dose administered between groups. All curves fit the Venegas equation with R2 > 0.995. The derived Venegas parameters for all animals are shown in Table 1. In the Control group, average VT was 7.4 ± 0.4 mL/kg. This was higher than the 7 mL/kg target due to increased VT in 6 of 11 animals to control pH following oleic acid injury as per the ARDSNet algorithm. In the Experimental group average VT, optimised to the point of maximal compliance change, was 9.5 ± 1.6 mL/kg, significantly higher than in the Control group (p < 0.05). In the Experimental group, the average 95% margin of error for the target VT was 1.06 mL/kg. Of the 11 animals in this group, 10 had VT values higher than the ARDSNet protocol, and 9 of the associated 95% confidence intervals did not contain 7.0 mL/kg. One animal had a target VT below 7.0 mL/kg, although the associated confidence interval contained 7.0 mL/kg. Combining all 22 animals as one group, values for VT calculated from the Venegas equation at P = c - 1.317d or V = a + 0.211b varied from a low of 3.3 mL/kg to a high of 13.5 mL/kg (Figure 2). This targeted VT was greater than 7 mL/kg in 18/22 animals. In the Experimental group alone, the range of individualized VTs was 6.6 -10.8 mL/kg. The corresponding Paw at the point c - 1.317d for each animal is also shown in Table 1. The range of Paw at this point showed substantial inter-animal variability ranging from 8.4 to 20.8 cm H2O, with a mean of 15.9 ± 3.4 cm H2O overall. Mathematically Calculated versus Algorithm Low Tidal Volume. VT calculated from the point of maximal compliance change (c - 1.317d) on the P-V curve for all animals (left hand points) as compared to Control group (ARDSNet algorithm) low VT (right hand points). Mean VT of each group given by large open square, connected by the dotted line. A representative P-V curve is shown in Figure 3, corresponding to animal 9 in the Experimental group. For this animal, the estimated parameters in the Venegas model were given by a = -23.3 mL, b = 1319.6 mL, c = 24.5 cm H2O, and d = 6.2 cm H2O. The data were collected over a wide range of pressures and volumes, and the model provided a good fit to the data (R2 = 0.996). The mean volume at the point of maximal compliance change was estimated to be VT = (a + 0.211b)/w = 10.2 mL/kg, (weight = 25 kg). The associated 95% margin of error was 0.54 mL/kg, derived from the estimated variance-covariance matrix for the calculated parameters. Thus the 95% confidence interval for this volume was 9.7 to 10.8 mL/kg, which, in this example, does not encompass the 7.0 mL/kg VT of the Control group. Representative Pressure-Volume Curve Fit to the Venegas Equation. Representative P-V curve generated at zero end expiratory pressure in a single animal in the Experimental group. Dots are individual data points. The line represents the Venegas equation derived P-V curve. The Venegas parameters a, c and b are labelled, as well as the volume at the point of maximal compliance change (P = c - 1.317d) and the volume equivalent to 7 mL/kg in this animal. See text for further explanation. The variability file for BVV introduced a coefficient of variation in VT of 15%. This translated into overall fluctuations in VT between 4.1 – 11.1 mL/kg in the Control group and 3.4 – 16.8 mL/kg in the Experimental group. Figure 4 shows the frequency distribution of VTs for each group calculated in bins of 0.5 mL/kg. A broader distribution was present in the Experimental group due to the greater range of initial centring VTs (6.6 – 11.3 mL/kg vs. 6.6 – 8 mL/kg) but it is evident that the addition of a variable ventilation pattern to both groups results in substantial VT overlap between groups. Frequency Distribution Curves for Tidal Volume for the Two Groups. Frequency distribution curves of VT for each group calculated in bins of 0.5 mL/kg. The VT bins are represented on the x-axis and the percentage of all VTs from each group in each bin is represented on the y-axis. Control = solid diamonds. Experimental = open squares. Equivalent minute ventilation was maintained in both groups at all times. This required a statistically significant increase in f to 30 ± 5 bpm in the Control group compared to 25 ± 6 bpm (p < 0.05) in the Experimental group from hr 1 to hr 5 (Figure 5). Peak and mean Paw increased to a similar extent after oleic acid infusion in both groups. Peak Paw was modestly, but not significantly, higher in the Experimental group compared to Control (25.0 and 25.9 cm H2O at 1 and 5 hrs respectively vs. 23.2 and 22.2 cm H2O at analogous time periods in Control) (Figure 6). Mean Paw was approximately 7.5 cm H2O at baseline and increased to 12.5 cm H2O after oleic acid, not different between groups at any time-period. Ventilation Parameter for the Control and Experimental Groups. Mean values of VT, f, and minute ventilation (VE) for Control (diamond symbol) and Experimental groups (square symbol) at each time period. Bars represent standard deviation. * p < 0.05 between groups at specified time periods. Mean Peak and Mean Airway Pressure for the Two Groups. Mean values for peak and mean Paw for Control (diamond) and Experimental (square) groups at each time period. Bars represent standard deviation. *p < 0.05 following oleic acid. In each animal, plateau pressure was determined by clamping the expiratory line for 12 – 18 individual breaths over the five hr period. Using this technique, plateau pressures were well within the "safe" range of <30 cm H2O in both groups: 22.3 ± 3.7 vs. 24.5 ± 4.7 cm H2O in the Control and Experimental groups respectively. Even mean peak airway pressures were below this theoretical upper limit (Figure 6). As well, plateau pressures were below the calculated value for the true inflection point c (mean value 28.6 ± 3.7 cm H2O and 28.7 ± 3.6 cm H2O in the Control and Experimental groups respectively), except for a single measurement in each 376-breath cycle of the program file (see Figure 1 for demonstration of the largest VT). Data are shown in Table 2. Similar changes in arterial blood gases occurred with oleic acid administration in each group. PaO2 decreased from approximately 250 mmHg to approximately 100 mmHg with oleic acid infusion in both groups, then it increased over 5 hrs to a mean of greater than 150 mmHg with no differences between groups. Following oleic acid injury, the PaCO2 increased significantly in both groups and remained elevated with no between group differences. 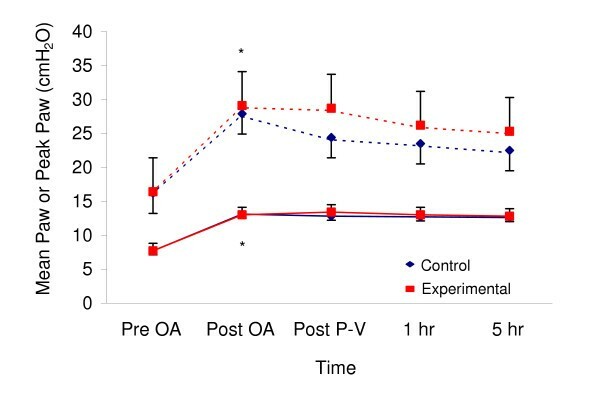 Mixed venous O2 (PvO2) decreased with oleic acid injury and remained depressed over the duration of the experiment in both groups. Arterial pH fell from 7.4 at control to 7.3 after P-V curve determination in both groups, associated with the respiratory acidosis. After 1 hr of ventilation, with adjustments in f and VT, PaCO2 showed evidence of normalisation and pH improved in both groups for the duration of the study. Respiratory system compliance (Crs) decreased significantly with oleic acid administration and decreased further after P-V curve analysis, with no difference between groups and no group × time interaction. Results are shown in Table 3. Mean arterial pressure (MAP) did not differ between groups at any time period. With P-V curve generation, mean pulmonary artery pressure (MPAP) increased over baseline but returned towards baseline values at end experiment in both groups. Pulmonary artery occlusion pressure (PAOP) did not differ between groups at any time-period. Pulmonary vascular resistance (PVR) essentially tripled with oleic acid injury and following generation of the P-V curve with some return towards normal over time in both groups. Cardiac output (CO) decreased significantly with oleic acid injury and remained depressed in both groups for the duration of the experiment. Experimental Group n = 11 Mean ± S.D. The average concentration of IL-8 in tracheal aspirate was 5510 ± 2540 pg/mL in the Control group versus 6500 ± 2440 pg/mL in the Experimental group, not different between groups by unpaired t-test (t statistic = -0.866, p = 0.397). With BVV, when "mathematically optimising" VT to the point of maximal compliance change on the convex portion of the P-V curve, no statistical improvement over the ARDSNet algorithm for VT selection was seen for oxygenation, respiratory mechanics or inflammatory cytokines in this animal model of ARDS. With either approach, acceptable gas exchange was maintained over 5 hrs and no significant differences in ventilating pressures, respiratory mechanics, dead space, shunt fraction or IL-8 cytokine levels were seen. We did not include a group with low VT in control mode as a previous study demonstrated significant advantages with BVV, both using the ARDSNet protocol . Four mechanisms have been invoked to account for these advantages: i) stochastic resonance (noise enhancement of an input signal) , ii) Jensen's inequality , iii) increased surfactant  and iv) enhanced respiratory sinus arrhythmia. The goal of the present study was therefore, not to examine BVV mechanistically, but to determine if the benefits seen previously with BVV could be optimised based on fitting the Venegas equation to individual P-V curves and then determining the ideal point on the convex portion of the curve about which to ventilate. Using the "mathematically optimised" approach yielded mean VTs that were higher than the ARDSNet algorithm (see Figure 2). 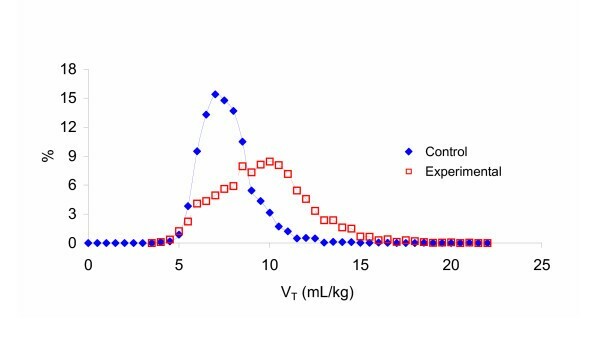 The majority of calculated VTs were between 8 and 10 ml/kg, and both Control and Experimental VTs were within the convexity of their individualised P-V curves. By ventilating with BVV in both groups, which introduced a coefficient of variation in VT of 15%, a substantial overlap of delivered VT was seen – apparent in the frequency distributions of VT (see Figure 4). We could not know a priori what VT calculated at the point P = c - 1.317d or V = a + 0.211b would be relative to Control VT but their proximity, coupled with the extensive overlap due to the addition of BVV, contributed to the lack of discernable difference between groups. The average "mathematically optimised" VT is marginally higher than that currently recommended by proponents of low VT ventilation. However, this VT is within the range chosen by most intensive care units managing ARDS patients worldwide  as well as the VT selected for the control arm of the three clinical trials showing no benefit from VT reduction (Control VT = 10.8, 10.3 and 10.2 mL/kg) [16–18]. The highest derived VT from Venegas curve fitting (13.5 ml/kg) approached what some clinicians may consider unsafe in ARDS patients using conventional ventilation . However, use of higher VTs in combination with BVV did not significantly increase airway pressures or IL-8 concentrations compared to Control and minute ventilation could be maintained at lower f. Lower f may ameliorate gas trapping that has been demonstrated in ARDS patients ventilated at f greater than 30 bpm . Although unable to demonstrate an advantage by "mathematically optimising" VT in the Experimental group, knowledge of the point of maximal compliance in combination with BVV may provide greater flexibility in choosing ventilator settings in individual patients, permitting a higher VT/lower f combination while maintaining acceptable airway pressures. is being exploited in the region of low volumes. Thus, a lower expected plateau pressure for a given mean VT with BVV is also a consequence of Jensen's inequality. Current recommendations to limit ventilator induced lung injury (VILI) include a combination of low VT and adequate PEEP to maintain an open lung with plateau pressures below 30 cm H2O. The plateau pressures over the course of this experiment, determined by clamping the expiratory line in 12 – 18 individual breaths per experiment, were well within the "safe" range in both groups: 22.3 ± 3.7 vs. 24.5 ± 4.7 cm H2O in the Control and Experimental groups respectively. Plateau pressures were also below the calculated value for the true inflection point c on the Venegas curve (mean value 28.6 ± 3.7 cm H2O and 28.7 ± 3.6 cm H2O in the Control and Experimental groups respectively). Even mean peak airway pressures were below this theoretical upper limit (Figure 6). In each experiment, a single breath exceeded point c (the upper bound for the convexity of the P-V curve). 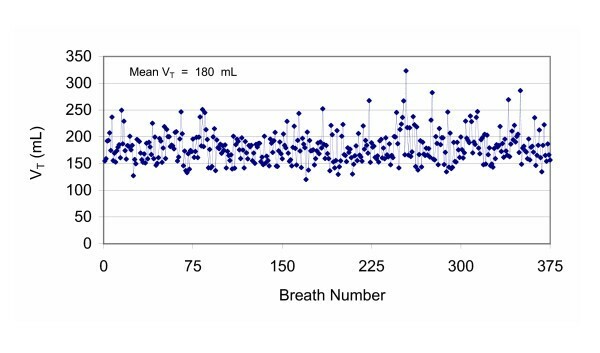 The average VT of this single largest breath delivered once in the file of 376 breaths (Figure 1) for the Experimental group was 426 ± 79 mL associated with a peak Paw of 42 ± 9 cm H2O at PEEP 8 cm H2O. Brower et al. 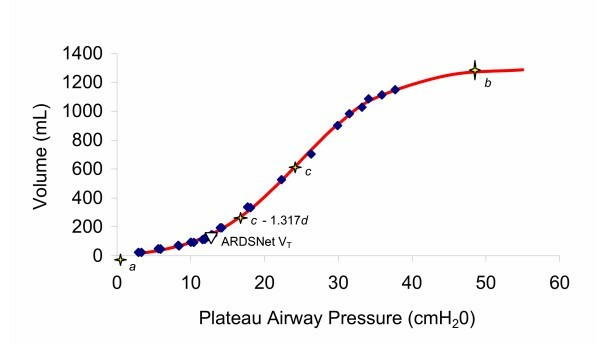 recently re-analysed the ARDSNet data by quartiles for plateau pressure and found that VT reduction was associated with reduced mortality in all patients, including those with plateau pressures less than 32 cm H2O. These authors contend that there is no "safe" level of plateau pressure in acute lung injury and the lowest VT and plateau pressure compatible with acceptable gas exchange should be a goal. If this is borne out, then application of a variable ventilator pattern, which has consistently resulted in improved gas exchange and respiratory mechanics at airway pressures that were equivalent to or lower than those obtained during conventional ventilation, in combination with the lowest VT, may be beneficial. The risk of strict adherence to low VT with conventional ventilation is alveolar derecruitment and reduced PaO2 and SaO2. While low VT strategies have been embraced, recent work indicates that survival from ARDS may be complicated by neurocognitive decline correlated to hypoxaemic periods during mechanical ventilation [23, 24]. Richard et al. advocate recruitment manoeuvres or increasing PEEP as alternative strategies to counteract low VT derecruitment. But recruitment manoeuvres did not show a sustained benefit for gas exchange in the ARDSNet trial  and increasing PEEP alone may be problematic. We have recently demonstrated that BVV is superior to an established recruitment manoeuvre to improve oxygenation in this animal model . Martynowicz et al. , using parenchymal markers in an oleic acid injury model have demonstrated that PEEP restores airspace volume only at pressures that result in a universal increase in parenchymal stress. Eisner et al. showed that the risk of barotrauma increased 1.67 fold for each 5-cm increment in PEEP and Esteban et al. determined that increasing PEEP was an independent factor associated with mortality during mechanical ventilation. A recent multi-centre trial has demonstrated no difference in patient outcome for low (8.3 cm H2O) versus high (13.2 cm H2O) levels of PEEP [29, 30]. Since PEEP greater than 8 cm H2O is not beneficial to outcome, application of a variable signal to the ventilatory pattern with BVV may provide an alternative approach, producing net recruitment of previously fluid filled or atelectatic units without the potentially harmful effects of either increasing PEEP or the use of prolonged recruitment manoeuvres that deliver high levels of distending stress. Additionally, variable ventilation promotes release of endogenous surfactant, offering another mechanism for improvement in alveolar stability . Potential criticisms of the present study include the use of PEEP and the use of a static P-V curve analysis for a dynamic application. Eight cm H2O PEEP was applied to both groups and resulted in peak airway pressures that exceeded the point of maximal compliance change for greater than 90% of breaths even in the Control group. The major consequence of this degree of PEEP is an upward shift of the P-V curve derived at zero end expiratory pressure (ZEEP) such that total volume would be greater at any point below c. However, in the models proposed by Hickling, this level of PEEP is associated with maintained convexity at lower VT and as such, has no effect on the interpretation of the results with regards to Jensen's inequality. We chose this level of PEEP to more closely approximate clinical practice, to provide evidence of a consistent lesion between animals with oleic acid administration and to ensure acceptable levels of gas exchange with the lower VT strategy. Initial attempts to analyse the P-V relationship on PEEP gave unreliable values for the point P = c - 1.317d in our hands; a consequence of inadequate definition of the lower asymptote in these earlier experiments. We recognize that application of VT values obtained under "quasi" static conditions may not be directly applicable to the dynamic breathing cycle due to a shift to the right that occurs with increasing inspiratory flows and the increase in volume that may occur at the beginning of the dynamic inspirations due to recruitment from tidal volume independent of PEEP . As such, our Experimental VT settings should be considered a first attempt to utilise information obtained from P-V curves to individualise BVV settings and may have also contributed to the lack of difference seen. However, a rightward shift of the curve implies that Jensen's inequality may apply over an even broader VT range provided that a convex P-V relationship is maintained. Examination of dynamic P-V loops from Rimensberger et al. indicate that convexity persists. In addition, further analysis of the Venegas equation reveals its derivative closely resembles a Gaussian distribution . Thus the probability density function of this equation indicates the likelihood of alveolar recruitment at a given airway pressure and the equation itself could be deemed the cumulative distribution function for alveolar recruitment. Airway opening leading to alveolar recruitment is curvilinear . Under such circumstances Jensen's inequality implies that a noisy mean driving pressure could augment recruitment. In an oleic acid lung injury model, Wilson and colleagues  suggested that oedematous lung did not open and close, but that alveoli changed from fluid-filled units to air-filled units with the P-V curve strongly sigmoidal. Following lung injury, at 3-5 cm H2O PEEP, convex curvature was seen in P-V curves over the range of inflation pressures seen in our study. They examined P-V curves for regional lung volumes of 1-2 mL, using the parenchymal marker technique. Thus in a similar model to ours, convexity was demonstrated for small regional lung volumes, suggesting applicability of Jensen's inequality with an oleic acid lung injury model of ARDS in the presence of PEEP. These authors further developed a mathematical model based on their findings. Until airway pressure exceeded 8 cm H2O (the level of PEEP in our study), the duct to the fluid-filled alveolus was assumed blocked by a liquid bridge. Above this pressure, the P-V curve was convex as the air bubble penetrated the mouth of the alveolus for various degrees of fluid filling. When the alveolus remained fluid-filled, the lung compliance was low. An abrupt change occurred as the air bubble entered the alveolus. At this transition, compliance rapidly increased with no change in alveolar tissue volume. Based on this modeling, when the lung is oedematous, noise added to the mean airway pressure signal will increase the likelihood of inducing the abrupt change in compliance, seen with entry of air bubbles into alveoli, a situation that would result in improved gas exchange. The lack of difference between groups suggests that determination of a "mathematically optimal" VT may be clinically irrelevant during BVV, provided that ventilation is occurring on the convex portion of the P-V curve. Adhering to the ARDSNet algorithm in this study assured that ventilation occurred on the convex portion of the curve in all animals. Knowing this may be advantageous due to the difficulties applying static curves to dynamic conditions listed above. Moreover, rigorous definition of the P-V relationship requires a finite time off the ventilator, can be difficult to analyse clinically, and imposes a potential risk for instability in gas exchange and mechanics during the manoeuvre. PaO2 and compliance decreased in 18 of 22 animals immediately following P-V curve determination in the present study, providing credence to the above concerns. However, the results of the present study suggest that when ventilating with BVV, knowledge of the point of maximal compliance change on the convex portion of the P-V curve relative to VT determined using the ARDSNet algorithm might permit adjustments in VT in selected patients without the risk of excessive airway pressures. Finally, Jensen's inequality can be generalised and as such defining a simpler equation for the convex interval of the P-V curve under low VT conditions is possible. We chose to examine only intratracheal IL-8 levels as a marker of inflammatory changes in the present study as previous work in our laboratory did not demonstrate measurable effects on tumour necrosis factor α, IL-6 or IL-10 in this porcine oleic acid model . The high level of tracheal fluid IL-8 measured in both groups is comparable to our previous results. Similar cytokine levels for the two ventilatory approaches suggest that the inflammatory injury was comparable. In this porcine model of acute lung injury, "mathematically optimised" P-V curve fitting to calculate the mean VT/kg about which to centre variable ventilation yielded a broad range for this calculated volume. Although not clearly advantageous over the standard approach – low VT as determined by the ARDSNet algorithm – VT selected mathematically according to the point of maximal compliance change on the P-V curve, in combination with a variable pattern of ventilation, may permit some leeway in VT settings provided that airway pressures are maintained within acceptable limits. This study also indicates that the standard ARDSNet algorithm assures ventilation is occurring on the convex portion of the P-V curve with this model. Application of Jensen's inequality provides theoretical proof of why a noisy or variable ventilatory approach is advantageous under these circumstances. The authors thank Respironics Inc. for providing the Esprit ventilator for the study and the hardware and software development for BVV as well as financial support. The authors also thank Biovar Life Support Inc. for financial support. We thank Elizabeth Walker for carrying out the cytokine assays. Dr. Mutch is co-founder of Biovar Life Support Inc., which has developed the mechanical ventilator described in this paper. Worldwide exclusive rights to this ventilator have been licensed to Respironics Inc. To date no ventilators have been sold clinically. In the event of sales of this ventilator, Dr. Mutch and the University of Manitoba would stand to gain financially. None of the other authors have a financial interest in the ventilator. M.R.G. supervised conduct of the experiments, helped analyse the data and helped write the paper. C.J.H. was responsible for conduct of the experiments as a fellow in the Anesthesia Laboratory. J.F.B. did the Jensen's inequality modelling and the statistical analysis related to the P-V curve fitting. L.G.G. helped with the experiments, data retrieval and collation and table and figure production. B.M.M. supervised the cytokine assays and their interpretation and helped write the paper. W.A.C.M. conceived the study, analysed and interpreted data and helped write the paper.